It is a parental nightmare. You have spent 18 years cajoling (mercilessly nagging) your children to make the most of their schooling so they can fly free and secure into adulthood and, just when you think you are done, they finally tell you what they want to study at university. History. Fine Arts. Music. Philosophy. Linguistics. And you just know they are going to be another overly-educated Uber driver. But Humanities and Liberal Arts graduates can end up anywhere. Just ask former Westpac CEO Gail Kelly (who studied Classics), her successor Brian Hartzer (History), former Telstra CEO David Thodey (Anthropology) or even Alibaba chairman Jack Ma (English). Yes, the ranks of CEOs in ASX100 companies are jam-packed with people who studied engineering or science (around one-third, thanks to the size of the resources industry), commerce and accounting. But, even in a country where business often sneers at non-vocational education, around 11 CEOs with Arts degrees have managed to make their way to the top. As a specialist in leadership development with over 30 years in Australia and Europe, I have discovered it is the business leaders with a wide scope of interests and knowledge that are the most successful – not those who just do one thing very well. The higher you go up in an organisation, the more you find people who are broader in their thinking and curious about the world around them. If you aspire to these positions, it would pay to develop a more ‘Renaissance’ attitude to learning, to read more widely and open yourself up to different influences. One characteristic of the great figures of the Renaissance (from the 14th to the 17th century in Europe) was their sense of curiosity about the world, especially when you look at someone like the great artist, inventor and polymath Leonardo da Vinci. Da Vinci painted some of the world’s most famous paintings, sketched the world’s first helicopter, studied human anatomy, helped design cathedrals and wrote poetry. 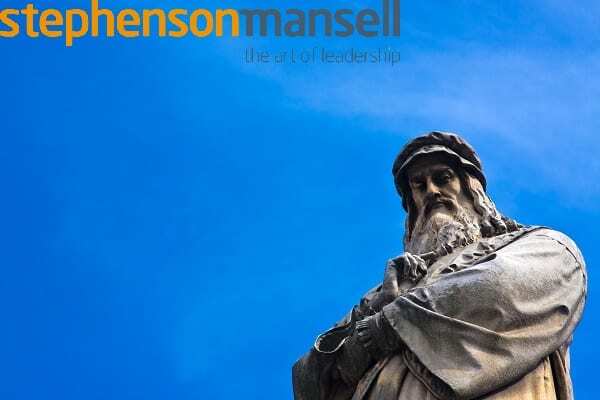 While da Vinci is a one-of-a-kind, a touch of that omnivorous curiosity can help to work out how world events and trends are going to affect you and your business. At a much more basic level, I have found that being curious without judging people can make you a much better leader. You will communicate better and get a greater understanding of others by just asking them questions in conversation. Communications skills such as these can help leaders get things done. According to the Harvard Business School’s Professor of Leadership, John Kotter, around 70 per cent of change initiatives fail. Unless you can translate that strategy into simple terms, so people understand what they have to do and what that means, you will never get them to make the changes that are necessary. In a ten-year leadership development project with Electrolux in Europe, I found it was very important to build trust when you were working with teams from different backgrounds, languages and cultures. The communication had to be clear and there had to be a “checking in”, so that everybody understood what was being said. When we analysed the big change projects that had failed, many times the reason was that time had not been invested in getting to know each other and meeting face-to-face to build trust before getting down to work. The “life skills” required to reach beyond cultural differences, communicate and build trust are forged through exploration and learning that goes beyond mere technical competencies. Put simply, you need to open your mind and your life. 1: Read widely. If you are not sure what to read, Google some recommendations from book awards or explore some categories on Amazon and see what piques your interest. Learn about other people’s lives through biographies. 2: Learn a language. While you are learning to speak another language, explore the culture that it comes from. 3: Travel. Spend some time living in other cultures and talk to people about how they do things in their families. 4: Seek out different experiences. Try things just for the hell of it. You will meet different kinds of people. 5: Learn a new skill, such as meditation, yoga, cooking. 6: Arts. Enjoy the theatre, live music and art.